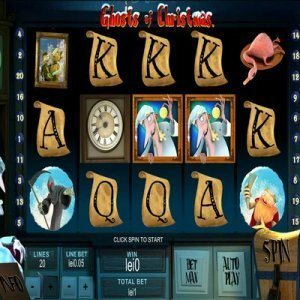 [miau] The Ghosts of Christmas online slot machine cleverly combines a beloved holiday with the thrill of the big casino and the chance to win big! With solid bonuses and Marley free spins, this five reel and 20 payline video game wraps itself around good ol’ Ebenezer Scrooge. And who else better suits both genres holiday and money? The idea, of course, is to infuse ol’ Scrooge with the spirit of giving … to you. Start spinning the reels and set up the combinations that makes the old penny pinching geezer realize that Christmas is about the joy of miracles and kindness. Do so to the point where his generosity overflows and let the newly reformed Ebenezer give you the greatest of gift of all … big wins. With every reel spin, you offer the Scroogester an opportunity to change his narcissistic ways. Reaching his heart through all 20 paylines promise to bring blessings galore to everyone. With its heavily influenced holiday theme, Ghosts of Christmas has Wild and Scatter Ghosts, a bonus feature and Marley’s free spins. Outside of the Bonus Clock and Scatter Ghosts, Wild Ghosts can substitute for any other symbol. It maximizes every spin’s possibility of a winning combination. The online slot game also offers a separate payout on any active payline that has two or more wild symbols. Keep an eye out for the Ghosts of Christmas bonus. Starting at the leftmost reel, if you get three or more consecutive Bonus Clocks on an active payline you activate a bonus round. The bonus round comes in three randomly chosen themes after the bonus is triggered. Following the holiday theme, they are Christmas Past, Present and Future. The themes are colorful and faithful but do not affect the bonus payouts or rules. During this period, you choose from objects that win cash prizes. The number of objects to be picked will equal the number of symbols triggered by the bonus. If you get three or more Scatter Ghosts at anytime anywhere on the reels, you can trigger up to 15 free games. This comes with a multiple payout of times three. These are Marley’s Free Spins. Once you pick one of the ghost symbols, the free spins start. Which symbol is chosen will impact the number of Free Games to play, that number being five, 10 or 15. In addition, get three or more bonus symbols during the free spins and get an additional 10 free games with a multiplier of three. And this is a bonus that can be retriggered again and again with no limit. With its solid graphics, atmospheric music and countless treasures to be had, it’s hours of potential fun promises a merry time for every player. Ghosts of Christmas is sure to be the online video slot game to play any time of year.